Cisco 8861 IP Phone | 8x8, Inc. 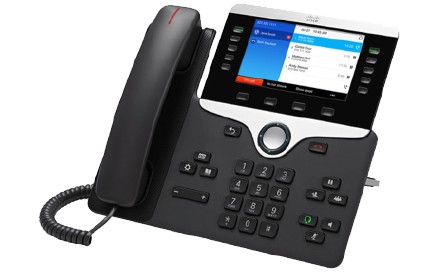 The Cisco 8861 is an IP desk phone perfect for supporting workers in medium to large size enterprise businesses. With the Cisco 8861, you can increase personal productivity through an engaging user experience that is powerful and easy to use. In addition, Cisco Intelligent Proximity allows you to integrate your mobile device with the 8861 to take advantage of the superior sound quality that is offered. The cost-effective Cisco 8861 allows users to navigate the phone efficiently with its five-way navigation cluster while also having easy access to 8x8’s rich set of hosted VoIP features.